WWF submitted the following Joint Civil Society Organisation (CSO) Position on behalf of a number of Pacific CSOs to the WCPFC Secretariat and the 14th Annual Scientific Committee Meeting (SC14). The position statement was developed with support from the Pacific Island Forum Fisheries Agency (FFA) Offshore Fisheries Management Project (OFMP II), and the Pacific Islands Forum Secretariat (PIFS) Non-State Actor (NSA) Programme funded through the European Union’s (EU) European Development Fund (EDF10) and implemented by PIFS, which collectively recognises the important role that civil society plays in the formation of robust democratic principles and processes. WWF has supported outreach, education, engagement, and participation of CSO groups and representatives in an effort to develop capacity among those individuals and organisations to understand and advocate for their interests within their respective national and regional fisheries management processes. 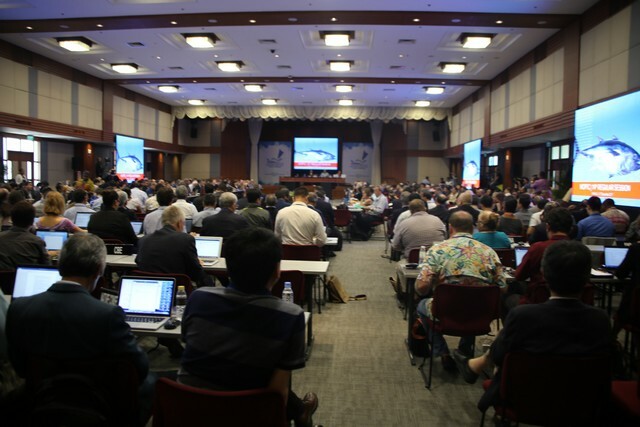 The current representation of CSO representatives at SC14 represents one of those efforts. The WWF-supported CSO delegation participating at the WCPFC SC14 in Busan, Korea include Mr Duncan Williams, Programme Manager, WWF-Pacific; Mr John Maefiti, Executive Officer, Pacific Island Tuna Industry Association and Mr Anare Raiwalui, Executive Officer, Fiji Fishing Industry Association. WWF Head of delegation is Mr Alfred 'Bubba' Cook Western and Central Pacific Tuna Programme Manager, WWF-New Zealand. PIFs. The legitimacy and importance of public participation in multilateral environmental agreements including fisheries is broadly recognised as international best practice and mandated for in a range of international instruments and agreements. In relation to fisheries, this participation has been codified in the United Nations Fish Stocks Agreement (UNFSA). The WCPFC 14th Regular Session of the Scientific Committee (SC14) provides for the review of best available scientific information before member states collaboratively develop recommendations for the Commission’s consideration. These recommendations ultimately shape the future of tuna stocks in the Western and Central Pacific. In addition, through the WCPFC’s responsibility to address social and economic factors, we look forward to the WCPFC continuing to apply a rigorous science-based approach to gathering evidence and developing analyses to attend to risinghuman rights concerns including observer and crew well-being and support, and vessel safety. We recognise and support the commitment made by the Commission to develop and put in place harvest strategies for tuna stocks in the Western and Central Pacific Ocean (WCPO) as referenced by CMM 2014-06. We recommend that SC14 take steps necessary to provide the required recommendations to the Commission that will allow for the timely adoption of Target Reference Points (TRPs) for ALL tuna stocks in accordance with the harvest strategy workplan as amatter of urgency. In making such recommendations to the Commission, we urge and remind the SC14 to ensure consistency with international principles (such as the limit reference point-related principles and guidelines of the United Nations Fish Stocks Agreement (UNFSA) relating to acceptable levels of risks of breaching limit reference points) is applied and observed. We express our particular concern over the status of South Pacific Albacore (SPA). The sustainability and economic viability of this fishery is of particular importance for those PSID Coastal State members that depend on the domestic fishery for their livelihoods and economic opportunities and we have experienced the downward trend in the Catch Per Unit Effort (CPUE). Even though the stock is in a reasonably healthy state and is not overfished or experiencing over-fishing, the scientific services providers acknowledge that a higher degree of uncertainty in the stock status when compared with previous years’ assessment results. We note with concern the recent estimated SPA catch levels for 2017 showed increased catches across all gears culminating in an overall 35% increase in the fishery from 2016 and a 14% increase from the average 2012-2016.We support and call for the practical consideration of previous advice from SC11 and SC12 that longline fishing mortality and longline catch be reduced to avoid further decline in the vulnerable biomass so that economically viable catch rates can be maintained. We also urge the SC14 to take steps necessary to provide the required advice that will ensure the Commission upholds its commitment to adopt a TRP for SPA at the Commission’s Fifteenth Regular Session (WCPFC15). We consider this work as of utmost importance to SC14. We note with concern that the adoption of harvest strategy work plans for the key species has continuously been delayed which may impact PSIDS that have invested in eco-labelling catch certification. We support and reiterate calls from private-sector participants with eco-labelling catch certification, sustainably conscious actors, and consumers along the tuna supply chain to support harvest strategy development and adoption. The provision of scientific advice by SC14 lays the foundation for the adoption of precautionary Target Reference Points and Harvest Control Rules for the key target tuna species. We believe this step should be taken while these stocks are in a generally healthy biological state. We continue to observe the benefits derived from robust observer reporting and, noting the gaps reported in the level and quality of observer data, urge the SC14 to make recommendations to the WCPFC for the continued strengthening of observer reporting and data collection in relation to monitoring of bycatch species. We support the efforts of the WCPFC SC14 to address the issue of overfishing of sharks and rays within the WCPO, and call for advice from SC14 that will ensure the adoption of a Comprehensive Management Measure for sharks and rays that includes an obligation to land sharks with their fins naturally attached to their bodies. We once again wish to thank the WCPFC SC14 for the opportunity to table our joint concerns. We again urge the Commission and its subsidiary committees to continue to observe openness and transparency of all WCPFC proceedings, and recognise the value that other constituents bring to the table. We wish to re-emphasise that the concern about the sustainability of the tuna resource is a concern that is shared by the undersigned in solidarity. We care, as it not only translates to economic security of our nations, communities, and families, but also to social, cultural, health, biological and environmental securities. We remain hopeful that the outcomes from the SC14 will take these considerations into account.